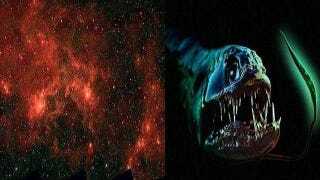 The biggest batch of young stars in our galaxy form inside the mouth of the Dragonfish. The 'fish' is a gas shell of material around the newly-forming stars. It was named by Doctor Mubdi Rahman, of the University of Toronto, who was inspired by Peter Shearer's portrait, entitled Black Dragonfish. The shell was discovered when researchers aimed their telescopes at the new stars and saw microwave images of the gas being blown away from them by their power. These stars are a true find: Most newly-forming stars are spotted in other galaxies. The images we get are too blurred to see the individual stars. These are close enough to count. And to wax poetic about. The full results of the discovery will be published in December, but you can learn more about the whole undertaking by taking a look at these preliminary statements provided by the University of Toronto. Images Courtesy of the University of Toronto.